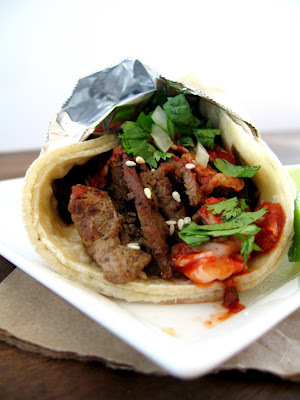 Korean tacos are all the rage right now in foodie circles, getting a lot of press both here in the States and abroad. Born out of the confluence of Mexican and Korean culture in Los Angeles' K-town, these tacos unite the flavors of two of my favorite cuisines in some of the tastiest street food ever. Denizens of LA and its environs have the great fortune of easy access to a fleet of Kogi trucks, serving Korean-Mexican fare at varying locations throughout the week. A number of weeks ago, one of these famed Kogi trucks made a rare visit to Santa Barbara, and I and some of my foodie friends went with much anticipation to sample some of their specialties. Unfortunately for us, what I had thought was an insiders-only Kogi truck stop in Santa Barbara turned out to be a widely-publicized event, and we hadn't counted on the mass of people coming in from all corners of Santa Barbara county (and beyond) to get a bite. After waiting well over an hour and only making it through a quarter of the length of the line, my friends and I reluctantly abandoned ship and headed over to a local Mexican taqueria, starving and disgruntled because of all those out-of-towners who got between us and our K-tacos. But as you know, dear readers, I've been working on my own K-cooking skills, and as I munched on my carne asade taco that disappointing day, I realized how easy it would be to just make some of these fusion tacos myself. You can bet that I peeked at the orders coming from the Kogi truck, almost to the point of making the diners uncomfortable. I wanted to know what was going into those tacos! It was hard to get a good look, so I watched some Youtube videos, read some articles and blogposts, and then even visited a dive of a place here in town that boasted their own version of Korean tacos. (That last, by the way, was a disappointment--no kimchi in sight!) In the end, I just went with my gut instincts...I knew if I wanted the flavor combo I'd been imagining and looking forward to, I'd just have to make it myself. And they turned out to be pretty rad. If I say so myself. A delicious combination of comforting corn tortillas, savory bulgogi beef, spicy Korean red pepper, and fresh and tangy kimchi and cilantro. And after serving these up to a bunch of friends, I know it's not just me that thinks they're awesome. 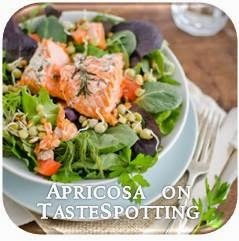 Dig in, guys, and enjoy! To assemble tacos, spread a dab of ssamjang on a warm tortilla. Then layer on a scoop of bulgogi, a sprinkling of roasted sesame seeds, some chopped kimchi, and some of the cilantro-onion mixture. As a finishing touch, squeeze fresh lime juice over the top. Whisk all ingredients together until smooth. 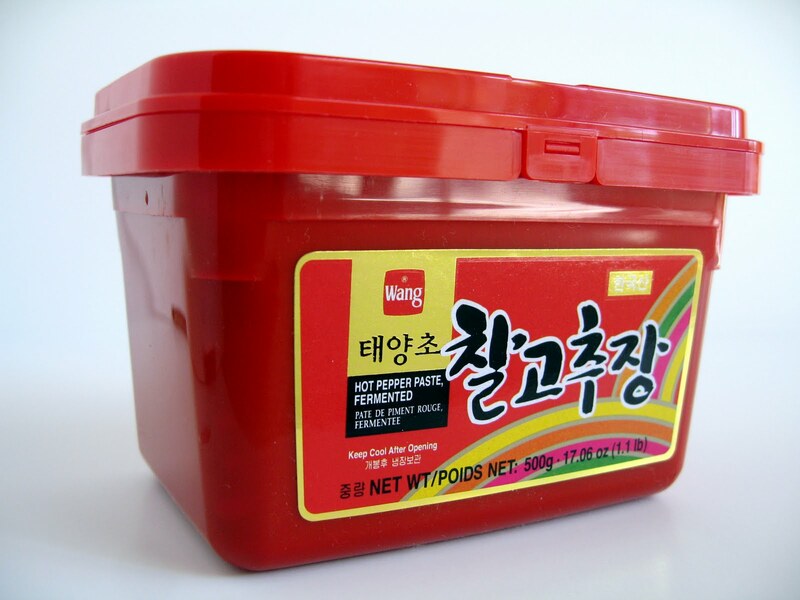 If desired, use as a base for a spicy Korean aioli by mixing 1 part ssamjang with 2 parts good-quality mayonnaise. 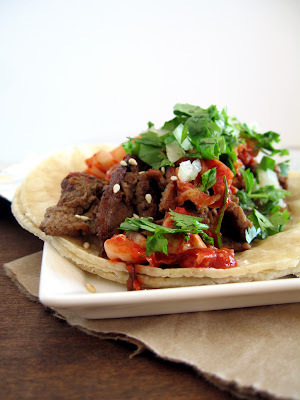 I love bulgogi beef, but would have never thought to put it in a taco. yeah, until I heard about this combo, I'd never thought about it either! but it sure tastes great! Erica, those were absolutely divine. Thank you again! And thanks for educating us on Korean food and culture as we prepared and ate the tacos. YUM! Yum, Korean BBQ is perfect in tacos! 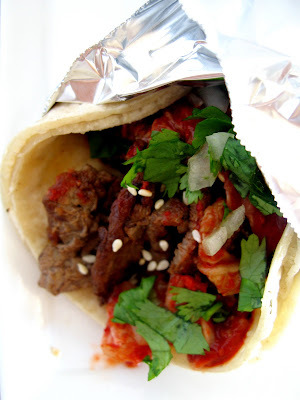 I have not had a Kogi/Korean taco, but yours definitely looks delicious. oooh, Indian tacos sound like such a great idea too! you'll have to let me know how yours turn out, what kinds of spices and taco fillings you use! Awww... I "heart" you Erica! I love finding "Americans" that really appreciate Korean food. And you're really doing a fantastic job of writing up these recipes!